Today I am sharing my top 10 picks for protein bars that are available on Amazon. These have all been taste tested by yours truly and I love each brand that is represented here in this Healthy Hot List. 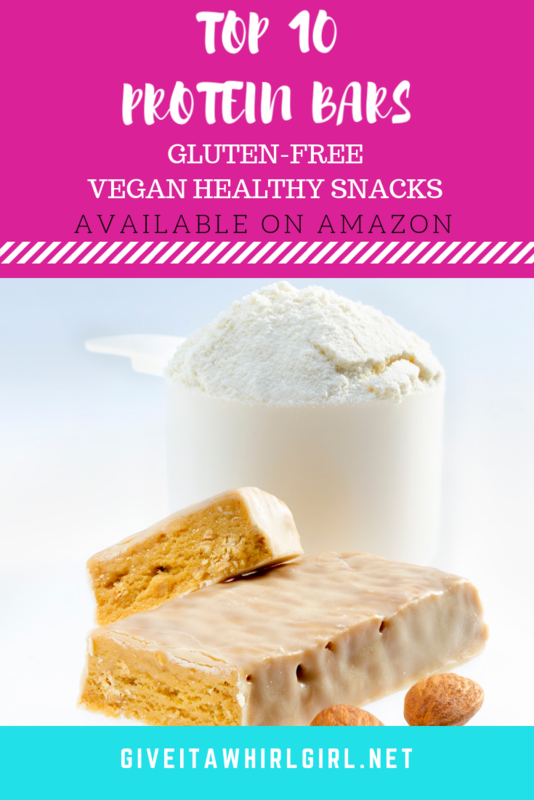 If you are on the lookout for gluten-free, vegan snacks chances are you will find some here that appeal to you in my Top 10 List of Protein Bars! What I love about the protein bars that are in this top 10 list is that they really truly do satisfy my sweet-tooth. These protein bars are all available in some really fun flavors that will trick your brain. They taste so indulgent but you can enjoy them without all the guilt! I have a huge weakness for anything that is birthday cake flavor! All of the protein bars that are mentioned in this Top 10 list are gluten-free, vegan, and packed with protein. Some of these bars can even be incorporated into your keto diet and lifestyle (just look for the zero or low sugar labels). Also, if you are like me and get impatient waiting for items to arrive, you are in luck! These products all include free 2-day shipping with your Amazon Prime membership! If you are not yet a Prime member you can sign up for a FREE 30-day trial. TRUWOMEN is a brand that I love and trust and I believe they earned the top spot here on my list of favorite protein bars. These plant-fueled protein bars are both gluten-free and vegan. Each TRUWOMEN protein bar is going to give you 12 grams of protein per serving. Be sure to check out the other fun flavors available: I Scream For Orange Cream, Oh Oh Cookie Dough, Saltylicious Almond Love, Smother Fudger, and Zamn Good Zesty Lemon. I just adore these little birthday cake flavored Protein Cakes by thinkThin! I always try to have at least one of these pouches in my snack stash. Each package contains two little protein cakes and 12 grams of protein per serving. Also available in Chocolate Cake and Red Velvet. These superfood bars from R.e.d.d. Bar are also gluten-free and vegan and these bars give you a boost in energy with a little dose of caffeine. Reaching for a R.ed.d.. Bar is highly recommended when that afternoon sluggishness sets in. Each of these protein bars contains 35 mg of caffeine and 10 grams of protein. Want to know which flavor is my fave? Salted Caramel all the way baby! If you love caramel you will be swooning over this flavor! Continuing on with the theme of things (gluten-free and vegan) may I present to you Thunderbird Bar? These protein bars are definitely one of my favorite healthy snack bars to reach for. I am absolutely in love with the wide variety of delicious flavors available! And if your kiddo has a craving for a Thunderbird Bar, you are in luck because Thunderbird Bar has four different fun flavors of bars for the kiddos! Choose from Chocolate Chip Cookie, Peanut Butter & Jelly, Apple Pie, or Fruit Punch! And my favorite flavor of Thunderbird Bar? Cacao + Hemp + Walnut! Truth be told, I do love Quest Bars but I feel as though they might be an acquired taste due to the texture of these protein bars. Quest Bars are one of my go-to brands for when I need to refuel. Quest Bars are a low-carb, keto, high protein (20 grams of protein per bar) solution for when you are having a snack attack. ONE Protein Bar is very similar in comparison to Quest Bars. These are another low-carb, zero sugar, high protein healthy snack. ONE Bar is gluten-free and vegan and there are 12 different indulgent flavors available. ONE Bar will be there to satisfy any sweet-tooth cravings that you have! Two of my favorite flavors from ONE include the birthday cake flavor and the maple glazed donut bar. Calling all peanut butter & jelly lovers! This Peanut Butter & Berries bar from RXBar is bursting with pb&j flavor! I am a huge fan of RX Bars but this flavor right here is hands down my favorite! RX Bars are an excellent snacking solution. Each bar has appx. 12 grams of protein. The best thing about RX Bar might just be that they are made with only all natural ingredients. They proudly display the ingredients smack dab on the front of the packaging. If you are into wafer treats then you are going to love these protein bars from Power Crunch. These are protein wafter bars that are drenched in a candy coating shell. You will get 13 grams of protein per Power Crunch protein bar and these are also quite low in sugar (5 grams per bar). I am just loving the wide variety of fun flavors that these are available in! Which flavor will you reach for first? I have my eye on the Red Velvet and the Chocolate Mint! Primal Kitchen is another top brand that I love and trust when it comes to eating healthy and clean! You are going to love these Primal Kitchen Collagen Bars! These bars are high in protein (15 grams) and also include a healthy dose of grass fed collagen. These collagen bars are perfect for your paleo (or gluten-free) diet and lifestyle. Want to find out more about these collagen bars? READ the review on my blog. If you would like to try Primal Kitchen’s collagen in smoothies, etc. they do have a Collagen Fuel powder available. And last but certainly not least, here we have protein cookies from Lenny & Larry’s! I know, I know, these are cookies and not bars but I do believe they earned a spot on my top 10 list! This variety pack of Lenny & Larry protein cookies features 16 cookies in 8 different, fun flavors! These protein cookies are gigantic and you can actually split them into two servings if you would like. That is what I usually do with these because they are very filling! Each Lenny & Larry’s protein cookie contains 16 grams of protein. Err with caution here if you are watching your sugar! Each serving (1/2 a cookie) has 15 grams of sugar. That’s fine though… just have a Lenny & Larry’s cookie on one of your “cheat days”! Grab a 12 pack of their best-selling Chocolate Chip Cookie flavor! Or you can go with my personal favorite Birthday Cake! Shop Amazon for all of your protein bar needs! I hope you all enjoyed this Top 10 Protein Bars list that I am sharing with you today! Decisions, decisions! Which protein bar(s) will you choose? I believe I have a little something for everyone here. If you can’t find an appealing flavor here there might be something wrong with you… lol! I am pretty open-minded when it comes to eating and I will try anything and everything once so all of the bars here are definitely appealing to me, of course. If you have a sweet tooth that is calling your name you can fulfill that sugar craving with the bars in this top 10 list. Feel free to leave me a comment about your thoughts on these protein bars. I would love to hear from my readers. What protein bar(s) will you be giving a whirl? Leave me a comment and let me know what bar(s) you are the most eager to try out! Want to do some shopping on Amazon? This entry was posted in Health and Wellness, Shopping Guide and tagged amazon, birthday cake, cookie, donut, gluten free, glutenfree, healthy food, healthy snack, Lenny & Larry's, ONE protein, Power Crunch, primal kitchen, protein, protein bar, quest bar, Redd Bar, rxbar, shopping guide, snack, thinkThin, thunderbird bar, top 10, truwomen, vegan, wafer. Bookmark the permalink. Thanks for sharing! I’m attempting to do Weight Watchers and I’m looking for meal replacements when I don’t have time to cook. And I think this is a list of great options to try! I’ve had the “ONE Protein Bars” and the birthday cake one is my favorite. Great post! I use these bars as a meal replacement quite often. They are perfect for snacking on while I am at my desk. Ooh I’ll have to give some of these a try!! I’m a vegetarian so I definitely need to make sure I am getting enough protein on a daily basis, which can be tough.